600 gallon acrylic reef tank with steel stand. The stand has been sand blasted an painted the aquarium is in great shape i just dont have time for it. tank is 105in long x40in wide x 30in tall the stand is the same. 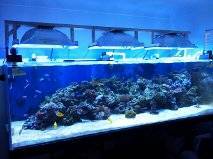 The tank is up and running with about 1500 lbs of live rock, 500 lbs of live sand,fish and corals. Sump and pumps are all in another room not understand.$5,000.00 OBO or trade for boat. or sale just tank stand an sump skimmer an pumps for best offer call 727-480-3353 No texting please.